LOS ANGELES » Hawaii's film commissioners promoted "Hollywood's Tropical Backlot" during a brief visit to Los Angeles this week to publicize the state's new tax incentives, part of an effort to boost the sagging commercial production business, once a lucrative source of revenue for the state. Colorful leis helped distinguish the four commissioners in the sea of approximately 1,200 industry pro- fessionals gathered Wednesday night at the Los Angeles County Museum of Art for the Association of Independent Commercial Producers awards show and party, honoring the most artistic commercials of the year. Many wore blazers over T-shirts. Hair was carefully styled to look messy. Dark glasses stayed on even as the sun disappeared. And most clutched cell phones and Blackberries like security blankets. State Film Commissioner Donne Dawson, Honolulu Film Commissioner Walea Constantinau, Benita Brazier of Maui County and Art Umezu of the County of Kauai networked and checked the placement of event napkins inscribed with "100 % Aloha; 15-20% off everything else." Big Island commissioner Marilyn Killeri was busy circulating newly translated explanations of Act 88 in Japan. * Act 88, which took effect July 1, offers a 15 percent rebate for shooting on Oahu and 20 percent for filming on a neighbor island -- up from just 4 percent statewide. It is the first time that commercials, which typically cost $300,000 to $500,000 to make, have qualified for tax credits. And many consider it a notable alternative to the complex Act 221. Frank Scherma, president of @radical.media and a powerful producer with offices in New York, Los Angeles, London, Paris and Sydney, said simply, "I've shot in Hawaii a lot, and it's expensive." He indicated that the new financial incentives would "make a big difference." 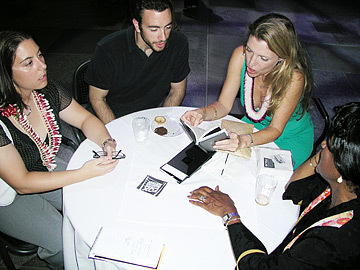 Following the Association of Independent Commercial Producers awards show Wednesday, Hawaii film commissioners Benita Brazier, right, and Donne Dawson, second from right, chatted with filmmakers Jennifer Haire and Darius Shahmir, who recently finished shooting a short movie on Maui. The reason? "There are places that are cheaper than Hawaii, but the infrastructure isn't as good," said Scherma, whose wife grew up on Oahu. In other words, producers who think they can stretch a dollar by going to Brazil end up bringing an entire crew with them, rapidly inflating costs. "Hawaii has great qualified crew across the board," he noted. Prior to Act 88, productions had to spend at least $2 million for film and $750,000 for television to earn the tax credits. Now the minimum expenditure requirement is $200,000 for commercials or feature films. The legislation also carries specific obligations that ensure productions will help train the local work force. "By lowering the threshold, we're going to be able to attract a lot more," said Dawson. From 1993 to 2000 the state garnered approximately $82 million a year* from productions, an estimated 20 percent* of which came from commercials, said Constantinau. With commercials, up to 90 percent of the crew is hired locally because the rapid shooting schedule prohibits producers from bringing their own. And the people who do come spend top dollar for hotel rooms and other services. "Commercials help to build the infrastructure of a location," said Dawson. "They're a really important foundation. And they are really the bread and butter for the neighbor islands." This sector of the business, however, "has definitely tapered off in the last four to five years, largely because of incentives offered in other locations," Dawson said. Constantinau said Hawaii is lucky to get six national commercials each year. Hawaii faces stiff competition from Canada, the United Kingdom and several mainland states that offer rebates in the 30- to 40-percent range. The key seems to be accessibility to a worthwhile package. Several producers said that tax breaks mean nothing if the process is so cumbersome that it becomes impossible to take full advantage of them. Kris Mathur, an executive producer who specializes in tropical comedy, has shot in Hawaii 12 times. "We haven't been there recently," he said, "but these incentives are a good reason to return." Both he and partner Eriks Krumins agreed that creative needs top the priority list. If the script calls for emerald blue water and low-lying palm trees swaying in the wind, "you can't get that look unless you go to the South Pacific, and Hawaii is easy," said Mathur. But the final decision usually comes down to cost. "Hawaii has been on a downslide of productions," said Matt Miller, president and chief executive officer of the Association of Independent Commercial Producers in New York. "There are a lot of compelling reasons to shoot there, but (the state) needs to bolster the infrastructure and sell it. It's not good enough that (tax incentives) are in place. To find its full stride, Hawaii really has to be out there and marketed" -- like states whose legislatures have allocated significant funds to promote their destinations. Still, the film commissioners' personal attendance seemed to make a difference. "I notice Hawaii has a great presence at many different industry events," said Angie Gollmann, advertising sales director for American Cinematographer magazine. "And if you have a presence, they'll think about you." Steve Caplan, executive vice president of AICP in Los Angeles, agreed. "Hawaii being here makes a very serious statement," he said. The marketplace is global, said feature film veteran Jeff Barnes, of CafeFX, and the perception about Hawaii is that "it's just too expensive." New initiatives are meaningful "but may not be enough." Streamlining those incentives, minimizing restrictions, promoting the capabilities of the locally based crew and offering post-production options would help significantly. The film commissioners tried to transform questions and concerns into opportunities, filling each day of their Los Angeles visit with meetings with executives from Paramount, Disney, Universal Film and TV, Showtime, CBS, Fox and many others. Armed with leis, chocolate-covered macadamia nuts and rebate details, they felt confident of making a strong impression in the fiercely competitive environment. "There's something wonderful about the place where we live," said Dawson, "and people want to be close to it." » From 1993 to 2000, the state received about $82 million a year from productions filmed in Hawaii, an estimated 20 percent of which came from commercials, according to the Hawaii Film Office. An article, "Isle Film Czars," on Page A1 Friday morning and B1 Friday afternoon listed incorrect figures. Also, Act 88 is the name of the state law covering tax rebates for all manner of film productions, and Marilyn Killeri was circulating translations of the incentives in Japan and did not attend the AICP in Los Angeles.